As the 2010-2011 school year is currently in full swing, and virile minds are prime for gaining intellect, author Kariem Abdul Haqq encourages students, teachers, and school administrators not to forget a very important celebration. His book, The 13th Amendment Freedom Week Manual presents a very important time that should be remembered and celebrated in schools throughout the United States. Kariem Abdul Haqq manual is a guide that teaches administrators and teachers the importance on celebrating a large accomplishment in America’s history. Through outlining the historical impact of the 13th Amendment, and how people of all races and ethnicities are thriving because of it, Haqq reveals why celebrating it the week of December 6th is a necessity. This commemorative week encourages the education of freedom, while learning from our past and shaping our future. As the 13th Amendment exorcised Blacks from slavery, this week encourages the mental exorcism of negativity, victimization, and strength. As the manual teaches the importance of liberation, it also shows how achieving this goal could not be possible without the help of help of many different races and paths of life; showing that the 13th Amendment was not just an achievement for Blacks, but for mankind everywhere. As the week of December 6th approaches Haqq encourages learning institutions everywhere to celebrate this momentous feat. 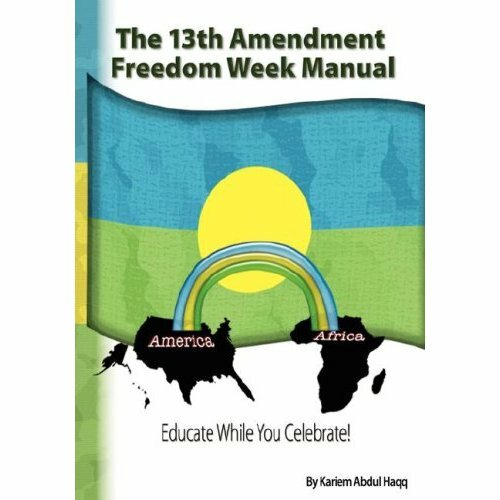 With historical accuracy and examples of the importance of unity, The 13th Amendment Freedom Week Manual will help students of all ages, races, and social backgrounds to learn from the past to improve their futures. For more information please email Kariem Haqq at: kahaqq@sbcglobal.net. You may also reach him at 314-537-4169. To purchase his book visit Amazon.com and click: 13th Amendment Freedom Manual.